I’m glad you landed here! You are most likely on this site because you care about your health, and perhaps you’ve lost your way trying to navigate through all the different diets out there. I am here to help! My name is Sarah, and I specialize in a Real Food Ketogenic Lifestyle. 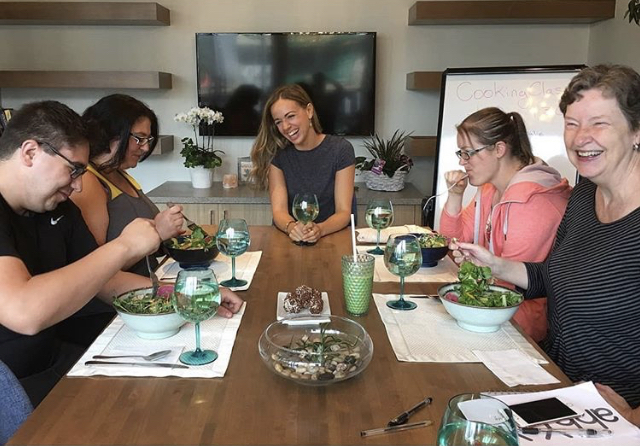 I am a certified Holistic Nutritionist who studied with the Institute for Integrative Nutrition, and am the resident nutritionist at AhhYaY Wellness Cafe in Kamloops British-Columbia. I have learned what I know not only through my training, but from years of my own research and experience in the field of Holistic Nutrition. It is my passion and love for delicious healthy food that brought me to where I am today, and I sincerely hope to convey some of that to you. My approach to the Ketogenic Diet is one that is centered around a large variety of vegetables, with just the right amounts of good quality fats and proteins. I also promote carb-cycling, which means that when certain higher-carb foods are in season around you, you will be able to enjoy them, hurray! There will be no calorie counting, no starving yourself, and certainly no boring food. My promise to you if we work together is to support you in making changes that will last a lifetime, so that you can feel your best, and therefore BE your best. To learn more about my upcoming Keto Workshops at AhhYay Wellness Cafe, visit www.ahhyay.com. To inquire about my fees for private cooking lessons, send me an email at sarah@realfoodcoaching.org or go to my CONTACT ME page. If you’d like a chance to work one-on-one with me to talk about your health and to set some goals together, you can email me at sarah@realfoodcoaching.org or go to my CONTACT ME page. During this session, we will discuss your health and lifestyle to determine how I can best support you in achieving your goals. What are you waiting for? Let’s do this!